This before/after feature was requested already some time ago. You can have it right now (okay, not so simple like in LR) by Ctrl+C; Ctrl+Alt+R and to come back Ctrl+V. Yes I know... a little stupid to do so, but works. Good to know. Fine for now. Thx! In the end, implementing the feature would have more or less the same speed (sometimes a little slow, depending on the used parameters). Resetting all parameters might not always be a good idea: debayer, transformation, etc. ... so this would be a reduced parameter set to be reset, I think. Maybe group boxes Processing, Details, HSL, Toning, Lin. Gradient, Filter & LUT. Group Boxes would be great for that matter. and even better to have receipt slots! Haha. That's a good one, actually! LoL... Let's do one step at a time. Less is more. We'll eventually get this one figured out one way or another. do what you think is best and we will love it! I was wondering if there is any opencl implementation for graphicscards, so the video would be rendered faster. All implementation in MLVApp is CPU based. This is why it runs on a wide range of computers. Until now we have no OpenCL code. If somebody likes to help with that, let us know! Excuse for my ignorance but was this to be expected w 10-bit lossless? I think I read it somewhere someone mentioning this very similar trick. Fiddling w White Levels (Tonemapped enabled) on these files seems to help w the pink highlights when trying to retain them. Surprised to see this much details in HL recovery especially from an EOSM. Fun stuff! the excellent highlight capabilities of mlvapp are almost always better for me than with resolve. In your video, the highlights (HL) are not blown up. They still retain full detail and allow you to process them as you like. Very often though, HL get overexposed and this is inavoidable (e. g. a window in an indoor scene). Moreover, the overexposed areas are very hard to see on the small screen during filming. If that happens, there is nothing you can do. The overexposed HL stay pink, no matter what you do. A similar situation occurs when filming at 9 bits lossless, (excellent for longer recording times at higher croped resolutions) and you underexpose the shadows. Once that happens, the underexposed shadows are red braunish and this really looks ugly. And, unfortunately, there is no way to fix them - make them look black. The perfect solution would be, if MLVApp automatically recognizes blown up HL and underexpoeed shadows and turns them into whites and blacks, respectively. I don't know if that would be possible though. Yes, this is expected and the way you should go, if overexposed highlights stay pink by standard. @IDA_ML: you really still have clips, where no way helps with pink highlights? Could you please upload some frames for me? For me the way DeafEyeJedi shows always works. That's true and I'm well aware. Just didn't know that it was due to the White Level issues because I could swear to myself that I tend to use ETTR respectfully without going too extreme. Or at least I try to stay within the boundaries. Tried 9-bit once and never went back. Sorry. Ha. Well if that's the protocol then we could eventually figure a way out. But if it's better to drive a stick shift than an automatic vehicle then so be it. It was just nice to be able to play with Black/White Levels with ease. More or less like a user preference, perhaps? If that's the case then I guess that's where I'll have to take a deep dive some time this week if not this weekend. Just took a peak and seems like there's another link within a link to go through in order to complete the test properly. Should be doable though. Thanks fo the tips, @Danne! Thanks for confirming @masc and now I feel better. 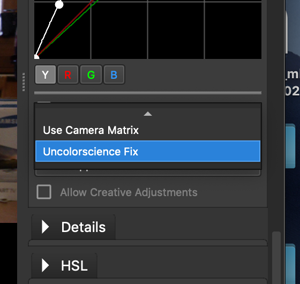 Here's another great example of HL fix even after shooting in ETTR and pull down 2 stops in MLV App (-2.00 exposure) along w few grades there and there. Yapp. Exposure=-2 and Lighten=50 is a better starting point than Exposure=0 and Highlights=-50, because edges will look way better. Or use curve tool. 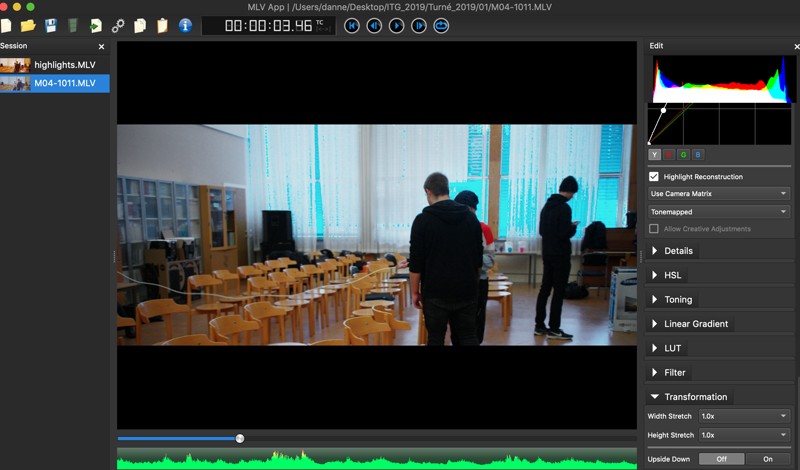 White level for 10bit EOS-M footage is somewhere 2600 and 2900, different in many clips - whyever. Could be iso correlations. Solving this by adding correct white level already in cam would be nice. An evening in front of a light bulb and working those tests pointed to from a1ex with raw_diag should do the trick. I am at work now and don't have my 100D with me. I will take a few shots tomorrow and will upload them for you. Yes, I agree, in this file there is a quite severe overexposure of the highlights. Following your instructions and setting White level to 2600, I was indeed able to remove the pink cast from the blown up areas but got other ugly artifacts in those areas - see for example the green leaves of the rose where the pink cast becomes yellowish. And yes, I agree that there is always a price to pay for blown up highlights but I love the way version 1.5 handles them. Do you think, something similar could be done to the underexposed shadows in files shot at 9 bits lossless? Thanks IDA_ML. Hmm... our algorithm works best for colorless tones, or if green channel should be in between blue and red with a similar curve. Reconstructing a "real green" if it is not there and if it is also not partially in the other two channels leads to problems. Maybe there are more intelligent algorithms out there... no idea. I have a similar problem with orange tones which get yellow/grey. The upper right half of the image was pink. But the original color is like the lower left half. Thanks, Masc, for this clarification. After struggling a lot with blown up highlights, I came to the conclusion that one should do their best to avoid them. ETTR is a great tool for that but it does not help much with camera movement where very bright objects may enter the scene and ruin it. To compensate for situations like this, I usually apply ETTR to the scene that I plan to shoot and then dial back the exposure by 0,5 to 1,0 stops. If nothing else helps then exposing for the highlights and then using Dual ISO is the last resort. Most of the time, this works best, especially in the high-resolution croped modes. 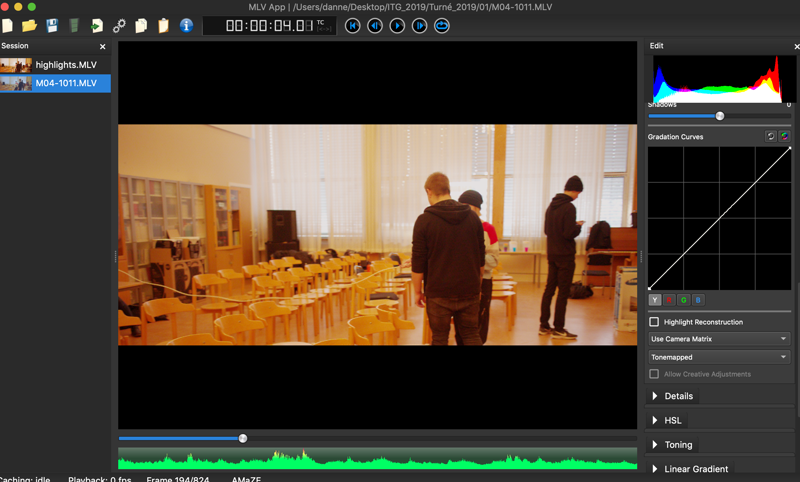 And I am really very happy that MLVApp handles Dual ISO files so well. Simply fantastic! Very often though, HL get overexposed and this is inavoidable (e. g. a window in an indoor scene). 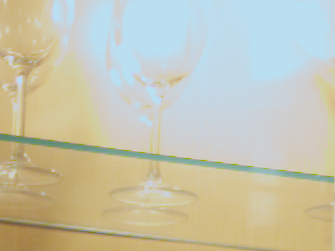 Moreover, the overexposed areas are very hard to see on the small screen during filming. If that happens, there is nothing you can do. The overexposed HL stay pink, no matter what you do. Try lowering white level. For the kind of highlights you describe that does remove pink colour, but of course does not bring back detail in the blown out window. In your video, the highlights (HL) are not blown up. They still retain full detail and allow you to process them as you like. Depends what you consider blown up. They certainly don't retain full detail, the green channel was fully destroyed in that case, but red and blue were preserved. Good work, Danne! Looks like another significant improvement of MLVApp. Agreed. This is just fantastic to see! I shot a straightforward over/under exposure test using MLV App 1.5 to make basic corrections to visually 'return' to N (Normal) exposure. Shot on 5D MkII (10 bit). Method 2) Using the Exposure slider to adjust down, then compensating using the Lighten slider to push back up. Hope this is useful for someone! @masc Finally tried the HSL adjustments: they're amazing!!! There is the ability to fine tune it, unlike rawtherapee's HSL adjustments where moving the mouse one pixel changes the hue by 180 degrees already. What we have in MLV App is a usable interface with controls that are not horrible, very rare in open source image editing. Thanks for all the great features you have added recently.